A cosmonaut unfurls a Russian flag outside the International Space Station during a spacewalk on Aug. 22, 2013, to mark Russian Flag Day. A misaligned piece of gear on the International Space Station caused headaches in orbit for two spacewalking cosmonauts today (Aug. 22), but they ultimately triumphed and even managed to celebrate Russia's Flag Day with orbital style. 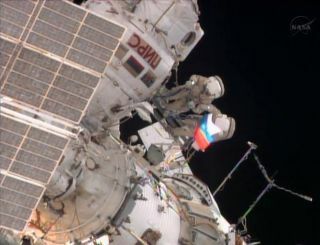 Veteran cosmonaut Fyodor Yurchikhin proudly waved a Russian flag while soaring 260 miles (418 kilometers) above Earth to celebrate Russia's Flag Day holiday, which just happened to coincide with their nearly six-hour spacewalk. A cosmonaut holds a Russian flag during a spacewalk outside the International Space Station in honor of Russian Flag Day on Aug. 22, 2013. Yurchikhin and fellow cosmonaut Alexander Misurkin let loose three "hoorahs" as they posed for TV and still cameras. They joked that some viewers wouldn't believe they were in space as the flag floated around them. "It's a wonderful day," Yurchikhin quipped. "Some people might think that this is actually a performance. That this is staged somewhere down there … this is in space, as real as it comes." The light-hearted moment capped a long day in orbit for Yurchikhin and Misurkin, who began their spacewalk at 7:36 a.m. EDT (1136 GMT). They spent five hours and 58 minutes working outside on what was their second spacewalk in six days. The cosmonauts spent more than seven hours outside the station on Aug. 16, setting a new record for the longest Russian spacewalk. Soon after beginning their spacewalk, the cosmonauts ran into a big obstacle with their primary task — the installation of a swiveling platform that will eventually house two cameras for a new optical telescope. The base of the platform was misaligned, prompting concern in Russia's Mission Control that it could spoil plans for the new telescope. "If the support for those cameras were not pointed in the right direction it could pose an issue for that experiment," NASA spokesman Pat Ryan said during spacewalk commentary. Mission Control initially ordered Yurchikhin and Misurkin to return the swiveling platform to their airlock, but later decided that it could be installed on the station as-is. It turns out the swiveling platform can be moved into the proper alignment once it is installed, Ryan explained. The object, engineers found, was a cover for one of the WAL antennas on the station's Russian-built Zvezda service module that help guide unmanned European cargo ships to dock at the orbiting lab. NASA officials said the loose cover, now space junk, posed no impact threat to the space station. Yurchikhin and Misurkin checked six of the WAL antennas, finding the covers to several of them loose. They used screwdrivers to tighten the covers back into place, which was hard work in their bulky spacesuit gloves. "Okay, they are tightened," Yurchikhin said after one particularly tough antenna check. "That was kind of a personal challenge for me." The beauty of Earth serves as the backdrop in this helmet camera view from a spacewalk by cosmonauts Alexander Misurkin and Fyodor Yurchikhin (who is visible in frame) as they worked outside the International Space Station on Aug. 22, 2013. At times, Mission Control piped in Russian music to entertain the cosmonauts as they went about their work in space. "That song was great, thank you very much," one of the cosmonauts said. "It was a little surprise," Mission Control radioed back. "You see, the songs help us," a cosmonaut answered. Later in the spacewalk, Misurkin used swaps to take biological samples along parts of a Russian airlock window as part of an experiment to see what types of bacteria can survive the harsh space environment. To the untrained observer, Misurkin's swabbing technique looked similar to cleaning the airlock window's frame. "Well, I think all the windows are clean. I think we should wrap it up," Misurkin said. The cosmonauts skipped only one task — the relocation of a foot restraint — during their spacewalk. Thursday's spacewalk was the fifth of five planned spacewalks for the space station's current Expedition 36 crew. In addition to Yurchikhin, Misurkin and Cassidy, the station crew includes Russian cosmonaut Pavel Vinogradov, American Karen Nyberg and Italian astronaut Luca Parmitano. It was the eighth career spacewalk for Yurchikhin, who finished the day with a cumulative total of 51 hours and 53 minutes and is now the fifth most-experienced spacewalker in history. The spacewalk was the third for Misurkin, who ended with 20 hours and one minute. The spacewalk was also the 173rd dedicated to International Space Station maintenance or construction. Assembly of the space station began in 1998, with the first crew taking up residence in 2000. It has been continuously manned ever since by a series of rotating crews.